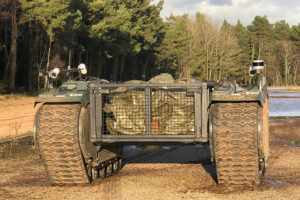 British troops are starting tests of more than 70 examples of futuristic technology including surveillance drones and unmanned vehicles on Salisbury Plain. One of the key areas is autonomous last mile resupply. The last mile, which represents the dangerous final approach to the combat zone, is crucial to ensuring soldiers have the food, fuel and ammunition to keep them alive. The Autonomous Warrior experiment will last four weeks and test a range of prototype unmanned aerial and autonomous ground vehicles which aim to reduce the danger to troops during combat. Defence secretary Gavin Williamson said: “Our troops now have the chance to test out a huge range of robotic kit in what will be the biggest exercise of its kind in our history. The exercise will finish with a battle group experiment, where the best ideas and products will be tested in simulated operational environments.